Dr.Web CureIt! detects and neutralizes viruses, rootkits, Trojan horses, spyware, and other malicious objects that have gone undetected by your anti-virus software. Program does not require installation and is compatible with all known anti-virus software. You do not need to disable your anti-virus software to check your system with Dr.Web CureIt! With Dr.Web CureIt!, you can test the efficiency of your anti-virus software and then decide whether Dr.Web is right for you. Unsurpassed self-defence mechanism and enhanced operation mode for neutralization of Windows blockers. Software is updated at least once an hour. Dr.Web CureIt! will cure infected files and place incurable files in quarantine. When the scanning is finished, you can view the report and perform desired actions with quarantined files. Once the scanning is completed, simply remove the Dr.Web CureIt! file from your computer. Anti-virus protection that automatically updates to protect you from continually evolving threats. As hackers develop new techniques, AVG’s research labs are constantly processing web data to provide new defenses to keep you automatically protected. Get on with your surfing and gaming without interference. Scans operate when you are away from your PC, and it also knows when you are gaming and ensures that the security operates in the background only, leaving you free to play. Files are checked before you download them without you having to do a thing. 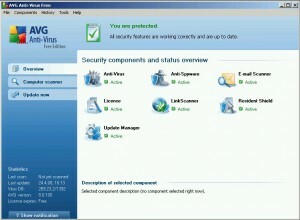 AVG Anti-Virus will also protect you when exchanging files through popular instant messaging like MSN and Yahoo. You want to search and surf, but you don’t ever want to go to any infected websites. AVG helps you out by clearly alerting you to threats and keeping you clear of them. With AVG protecting your system, you can chat and message your friends on Facebook and other social networks in the knowledge that each web page and link is checked for safety. You won’t pick up a malicious link from your friends – and you won’t send one either! AVG understands the need to stay safely connected to the web no matter your geographical location or time of day – our mission is to provide ongoing peace of mind on a 24/7 basis. 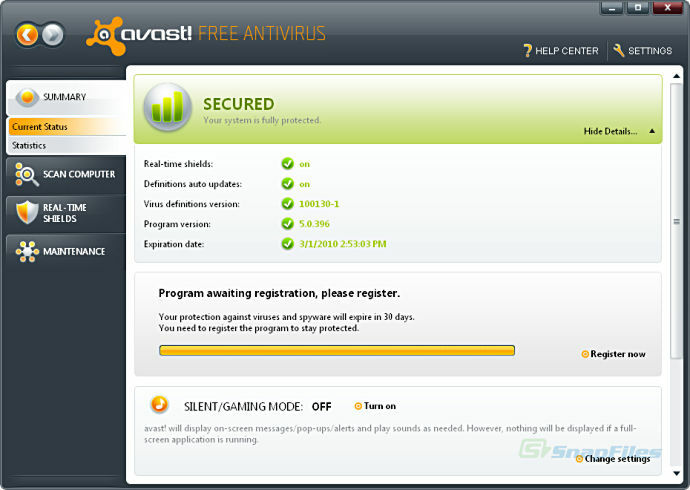 Avast Free Antivirus is a complete anti-virus package, that is is free for registered home non-commercial users. 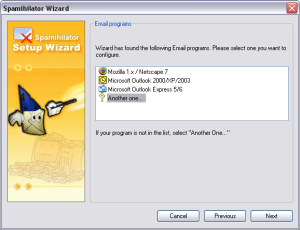 It contains an on-demand scanner with two interfaces (simple for novices and advanced for experienced users), an on-access scanner with Standard Shield (which protects against execution and opening malware programs) and an embedded e-mail scanner which scans incoming and outgoing email messages. Avast Free Antivirus integrates with the Windows Explorer right click menu and also includes a special screen saver which is able to scan your system while your computer is not in use. Updates are incremental and frequently made available for manual or scheduled download. Avast Free Antivirus often outperforms our competitors´ paid-for products in independent tests, leading in both security features and scanning speed. In fact, AV-Comparatives.org rated avast! 5.0 the fastest out of 20 antivirus programs! Having antivirus protection is critical and, fortunately, easier than ever. Download now and in just a few minutes you’ll be enjoying the peace of mind that comes from having the best and fastest online protection available.